Local papers and other media can be important and influential channels of communication. It is, therefore, important that significant importance is attached to media relations. 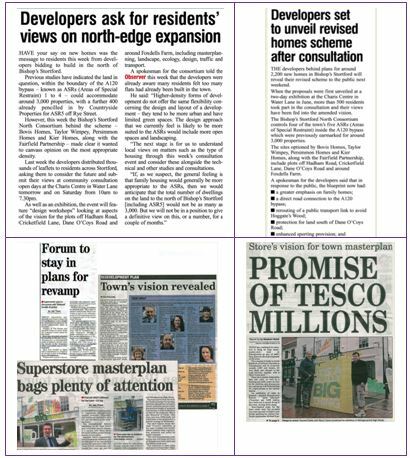 As part of our research, we identify the key local papers and other media likely to be interested in a particular proposal. We will also look to understand whether the paper has taken any position on matters that might be relevant as well as things like deadlines and the use of images. Once we are ready to go public on a scheme we will usually issue a press release explaining the proposals with accompanying images. Depending on the size and importance of the scheme we may also organise a press conference or individual briefings/interviews. As the project moves forward we will monitor articles in the local press and online carefully, looking to provide further information and/or correct misunderstandings as appropriate – the overall aim being to make sure that any debate is based on factually correct information and that, where possible, we can address any concerns.